Jerry Grey is a bestselling crime author. Writing under a pseudonym of Henry Cutter, his twelve novels have thrilled readers and granted a comfortable life to him and his family. Jerry is hard at work on his thirteenth book when he forgets his wife's name at a party. This seems like a simple slip of the mind, but soon he becomes more and more forgetful. Finally, he agrees to see a doctor who gives Jerry an unexpectedly grim diagnosis. At the young age of forty-nine, Jerry Grey has the early symptoms of Alzheimer's disease. Fast forward a year and Jerry's descent into dementia has reached a dismal low. His wife Sandra has left him. His daughter rarely visits him and refuses to call him Dad. Abandoned by his family and barely able to remember his past, Jerry finds himself in the care of a nursing home. As his malady continues to ravage his mind, Jerry begins to confuse his own actions with those of the characters he used to write about. He used the Henry Cutter pseudonym as a way to separate the horrors he wrote about from the joys of his family life, but now the two are indistinguishable. Most days find Jerry confused and confessing to murders that took place in his novel. Jerry has a habit of wandering from the facility in the night. When he is found, he is disoriented and has no recollection of how he escaped or what he did during the time he was gone. The situation becomes more dire when the police show up at Jerry's nursing home. It is no secret that Jerry has confessed to crimes from his novels, but now he has confessed to the murder of a girl who actually existed. Worse, her murder occurred on a night when Jerry escaped. Jerry is certain that he is not a killer, but he has no memory of the events of that night. With no alibi and a group of police seeking any closure to the case, Jerry struggles to defend his innocence and maintain his grasp on reality. The novel switches back and forth between the past and present. The past is told through Jerry's "Madness Journal" that he started keeping at the start of his diagnosis. He knew that his memory would begin to fail, so he wrote the journal to inform his future self of his life. These journal entries alternate with the story of present day Jerry and his ongoing mental decline. As the novel progresses, The past and present begin to come together and culminate in a electrifying conclusion. The mystery ends up being conventional to the crime genre, but the spin of an unreliable protagonist helps to keep the plot moving and the suspense tightly wound. Trust No One is an adequately dark thriller that skillfully breathes new life into the genre while adhering to the style that readers have come to expect. 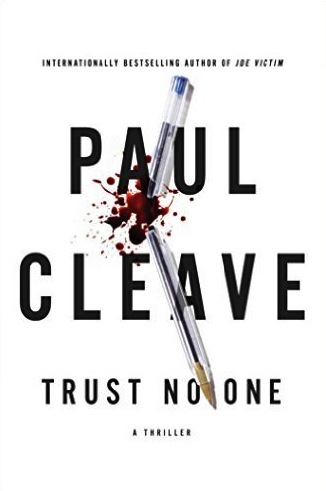 This entry was posted on Tuesday, August 4, 2015 and is filed under Alzheimer,Author,Crime,Dementia,Diary,Journal,Madness,Murder,New Fiction,Paul Cleave,Published Today,Trust No One. You can follow any responses to this entry through the RSS 2.0. You can leave a response. The unreliable narrator is key to the suspense in this one! Definitely interesting, the concept of not remembering and jumping from past to present reminds me a little bit of the movie Memento, although I hope this one is a little bit more straightforward. Nice review! I thought of Memento as well. This story is much more approachable though. Ooh, this is the Alzheimer's mystery one that you told me about. And you are definitely right about this one also having an unreliable narrator, especially as his forgetfulness is so strong in the end. I am interested to try this one as I liked the other book that I reviewed and it seems like they have some similarities while still being pretty different.